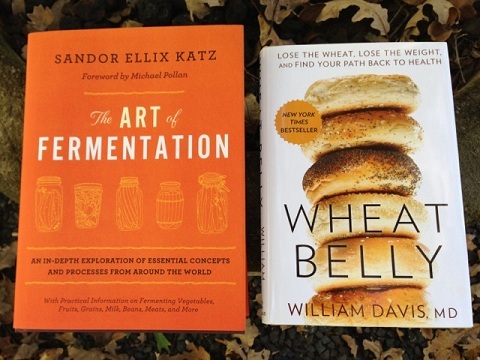 Two books that I recommend adding to your library are The Art of Fermentation and Wheat Belly. Several of you have mentioned hearing me talk about them on the radio show. Here is more information on both. Art of Fermentation: An in-Depth Exploration of Essential Concepts and Processes from Around the Worldby Sandor Ellix Katz. This book is a comprehensive guide to do-it-yourself home fermentation. Sandor Katz presents the concepts and processes behind fermentation in making sauerkraut, yogurt and many other foods. With illustrations and extended resources, this book provides wisdom for cooks, homesteaders, farmers, gleaners, foragers, and food lovers of any kind who want to develop a deeper understanding and appreciation for one of the oldest forms of food preservation. The book has detailed information on fermented vegetables; sugars into alcohol (meads, wines, and ciders); sour tonic beverages; milk; grains and starchy tubers; beers (and other grain-based alcoholic beverages); beans; seeds; nuts; fish; meat, and eggs as well as growing mold cultures, using fermentation in agriculture, art and energy production, and considerations for commercial enterprises. Eating fermented food is very important for your health and this book will help you learn how to experience that advantage. This cardiologist/author explains how eliminating wheat from our diets can prevent fat storage, shrink unsightly bulges, and reverse a myriad of health problems. Daily, over 200 million Americans eat food products made from wheat. As a result, over 100 million of us experience some form of adverse health effect, ranging from minor rashes and high blood sugar to the unattractive stomach bulges that preventive cardiologist William Davis calls “wheat bellies.” According to Davis, that excess fat has nothing to do with gluttony, sloth or too much butter, but is due to the whole grains. After witnessing over 2,000 patients regain their health after giving up wheat, Davis reached the disturbing conclusion that wheat is the single largest contributor to the nationwide obesity epidemic and its elimination is key to dramatic weight loss and optimal health. In Wheat Belly, Davis exposes the harmful effects of what is actually a product of genetic tinkering and agribusiness being sold to the American public as “wheat” and provides readers with a user-friendly, step-by-step plan to a wheat-free lifestyle. Informed by cutting-edge science and nutrition, along with case studies from men and women who have experienced life-changing transformations in their health after waving goodbye to wheat, Wheat Belly is an illuminating look at what is truly making Americans sick. Here are books by Howard Garrett.